Songa Rafting and Mount Bromo Tour Package 2 Days is one of Mount Bromo tour package option have We provided for domestic also foreign visitors who have combined with a white water rafting in Java Island. The trip needs 2 days 1 night that possible started from Surabaya Airport, Malang, Yogjakarta, Bali Island. Songa Rafting located on Pekalen River of Ranu Gedang Village, Gending subdistrict. From Mount Bromo to The Songa Rafting location (white water rafting) is 50 kilometers or 1,5 hour driving towards the Southern and 4 hours driving from Surabaya airport or Malang city. 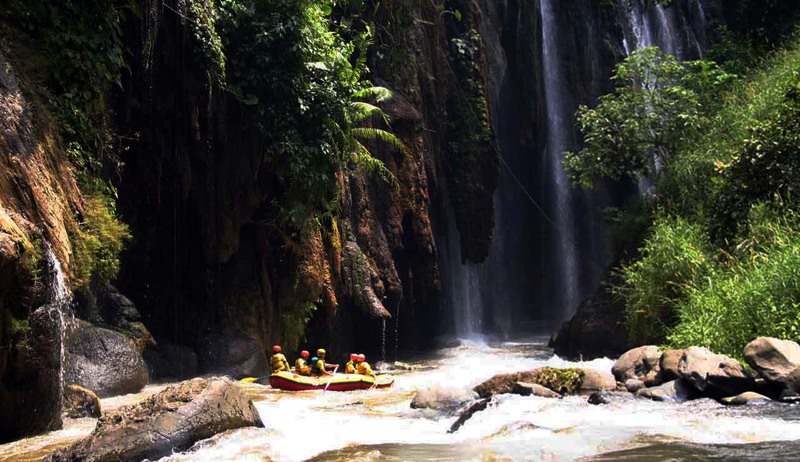 Songa Rafting Pekalen also known as White Water Rafting in Java Island that popular as an arena of thrilling sport, located at 500 metres above sea level. River bodies that could be used for rafting within 29 miles. the trip splitted into 3 section, the first Rafting Pekalen River (Beautiful Trip is 12 kilometres long), Middle Rafting Pekalen River (Fantastic Trip is 7 kilometres long), Bottom Rafting Pekalen River (Incredible Trip is 10 kilometres long). Songa Rafting Pekalen River also called as a paradise rafting, because it combines outstanding natural exotic with a row of bat caves and waterfalls that are not found in other rivers, various rapids also challenge and variation grade ranging begin grade II until IV. Our driver will pick you up in your arrival Surabaya airport or hotel, then take you to Songa Rafting for 4 hours driving by AC (air conditioned) transportation. After get the Songa Rafting Basecamp, break for 20 minutes to get instruction by local guide, then continue the trip to Pekalen River for 30 minutes driving by car with local guide service that completed with equipment. Get the Songa Rafting Pekalen, start your trip along 12 kilometres with 3 or 4 hours until finish in sawahan area. afterward, comeback to the Basecamp. After get the basecamp, change the clothes then have lunch in the basecamp restaurant, and continue to the hotel around Mt Bromo area to stay all night. After finish enjoy all the views from Pananjakan Bromo peak, comeback to the jeep, continue to your trip the Sea of Sand then do soft trekking to the Crater for 25 minutes or take the horse riding transportation for 15 minutes. If you are interested to enjoy Songa Rafting, Mount Bromo Tour 2 Days, You can discuss with Our partner about Mount Bromo tour price, and private travel facilities, by visit Our contact.